I was surprised not to like the Franz West exhibition at the Centre Pompidou. It’s no fault of the exhibition, but West’s trash aesthetic and anti-art intentions left me feeling cold and uninspired. I can imagine that it must have been very radical in Austria in the 1970s to experience West’s interactive sculptures and autonomous performances. But without West present to help me have that experience, I felt very much the intellectual snob. I felt even more guilty as I walked into the Tadao Ando exhibition in one of the small first floor galleries and breathed a sigh of relief to be looking at modernist plans and buildings. The intellectual brilliance of Ando’s architectural conceptions, the challenging aesthetic that is simultaneously, strangely beautiful, was far more comfortable than West’s playful, apparently revolutionary works. My cultural tastes are apparently more bourgeoise than I would care to admit. I am no architectural expert, so I don’t know how easy or difficult it is to exhibit architecture, given the point of this art form is to walking inside and experience a three dimensional space. Moreover, I would have thought that the discerning architectural critic needs to have the experience of living with the design over time, through different seasons, even at different times of the day and night. With those caveat’s in mind, I did think that the Pompidou exhibition showed the wonder of Ando’s creations from their conception through to three-dimensional video representations of their execution and finished state. 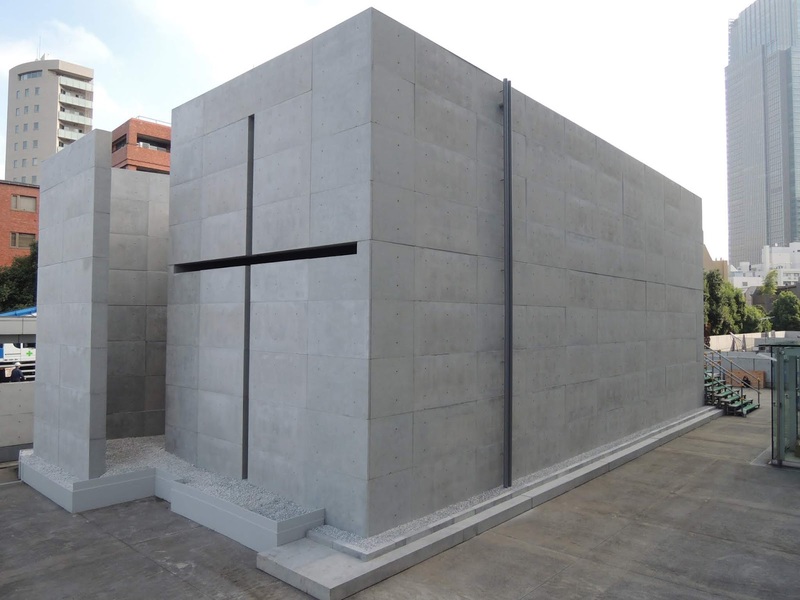 I have always wanted to go to Osaka to visit Ando’s neighborhood Church of the Light built in Ibaraki. I don’t have the language with which to describe this structure, not only because I am not an architecture critical, but because I find it mind boggling that anyone could ever imagine, let alone conceive of, the mechanics of the building. 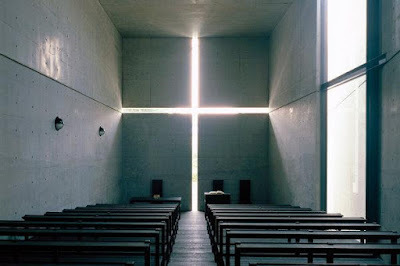 To have a shaft of light enter through scissions in the wall and not only form a crucifix in light at the altar (somehow this is the easy part), but to invite light to flood into the space of the church through an opening that also functions as the entrance is mesmerizing. 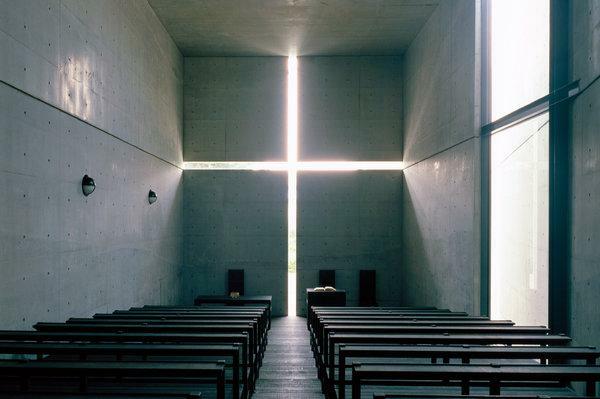 And then, to ensure that the congregation sitting in the intense light of the sun when inside what is in fact a simple concrete box, is sheer magic. Ando has made lots of art galleries and I can see how art museums and libraries are especially suited to his aesthetic. 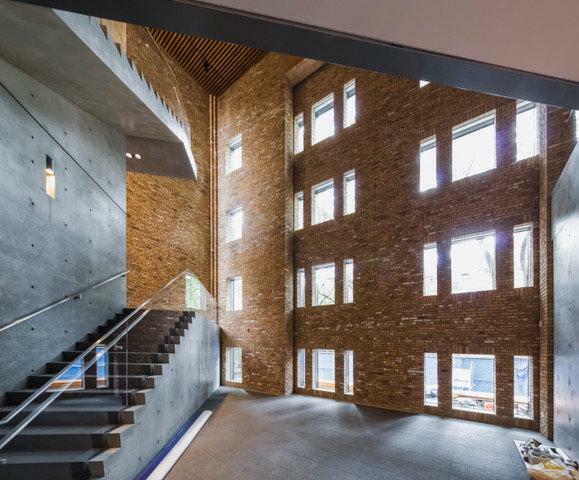 The choice of a brutalist concrete allowed to breath and to come alive through the events that take place within its walls, provides the perfect blank slate for art and books. Although it is a little difficult to know how comfortable these spaces are, I am looking forward to seeing and experiencing the Bourse de Commerce at Les Halles transformed into a museum. 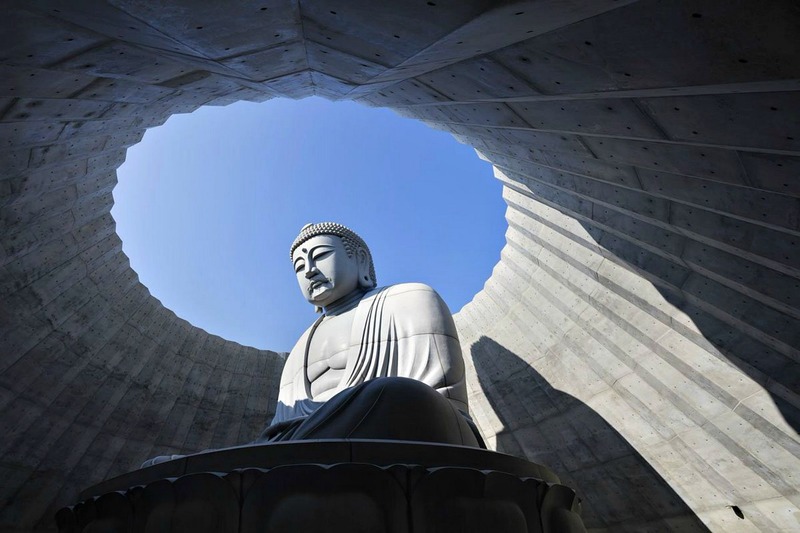 Perhaps the most extraordinary of Ando’s work was the Hill of the Buddha in Sapporo that he built to surround a stone statue of the Buddha. Buddha had been erected in the middle of a flat plain fifteen years prior to Ando’s construction. He built a hill, but only up to the shoulders of the Buddha, allowing his face be seen from a distance and from above, contemplating. The hill was then covered in lavender, and the accompanying video showed the hill change colour with the seasons: green in spring, purple in summer, white in the snow. Ando built a pathway to the Buddha that could not be seen from above, in order not to interrupt the field of green, purple or white. The design is the perfect demonstration of Ando’s integration of the most functional and, ultimately unaesthetic, manmade material of concrete, and in turn, how concrete becomes transformed by the natural environment. In addition, Ando’s aesthetic and philosophy suggests that the spirit of the visitors to his sites immersed in the natural world would enliven the brutalist concrete forms. Humans transform these spaces, not simply through using them, but also through our very being, in interaction with them. At the end of the exhibition, there is a video of Ando’s studio and we see people walking up and down the four flights of (again concrete) stairs. I wondered how comfortable it is to work inside these concrete walls. This is the question that must be answered by all architecture – it looks nice, but is it functional and is it a design for a space I want to be and to live with? As Ando’s transformation of Paris’s 19th century Bourse de Commerce into a museum is underway, I guess, I will find out the answer to my question very soon. 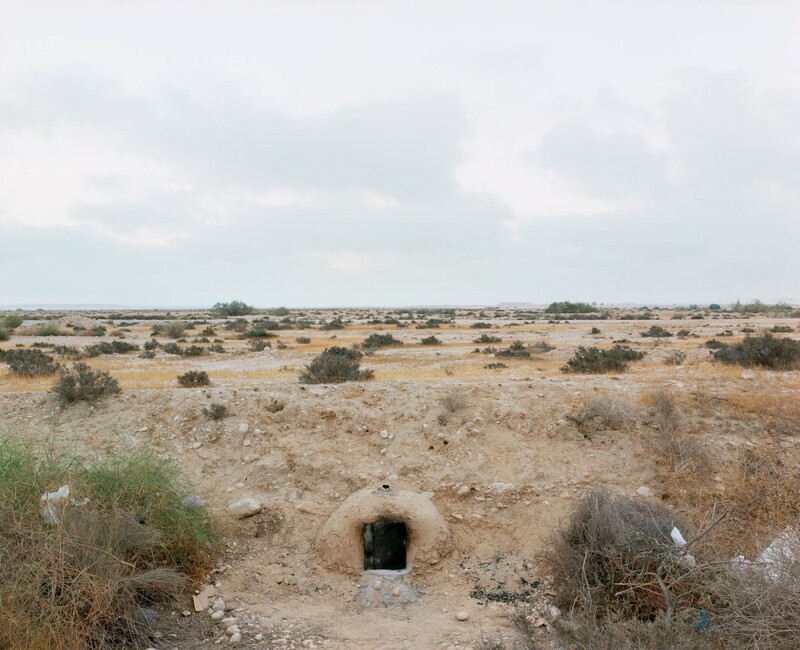 Ron Amir’s photographs and videos, Quelque part dans le desert currently on exhibition at the Musée d’art Moderne de la Ville de Paris make up the kind of work that if I had more time, I would be tempted to write an article about. The photographs are curiously documentary-like. I say, documentary-like, because their subject matter is so extraordinary, it’s difficult to believe that Amir hasn’t set up the shot with more manipulation than is made visible in the image. Which is to say, what results from Amir’s process are images that other photographers might spend hours, even days, looking for. But in the Negev desert surrounding Holot in Israel, the detention facility (that is, prison) for asylum seekers from Eritrea and Sudan, the material presents itself over and over again. There is no need for manipulation. The inmates waiting for asylum processing are allowed to leave the facility during the day, but as Amir’s photographs show us, there is nowhere to go. 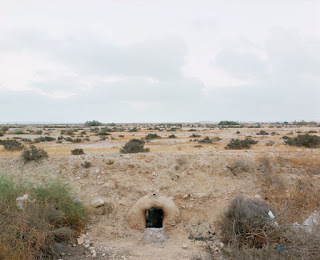 They are in the vast, lifeless Negev desert bordering Jordan and Egypt. 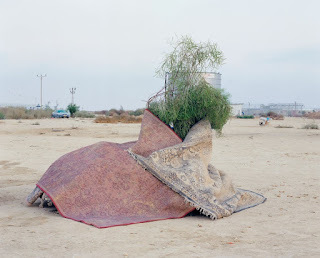 The tension between the two poles of freedom and captivity is one of many that animates Amir’s photographs and videos. The inmates are always being moved around the country by the Israeli government, while their time is spent waiting, waiting, waiting for visas and documents. They are stuck in the eternal nowhere land between bureaucratic hoops that they aren’t always sure if they are jumping through or not. Dichotomies that match this impossible state are repeated at every level of Amir’s images: still images placed next to moving ones, and in a video Don’t Move, 2014, a group of migrant men pose for a photograph as Amir sets up his box camera, tweaks the light, and so on. We feel their discomfort of standing still, their itching to move, and in between set ups, the freedom to move but again, with nowhere to go. Making the video becomes synonymous with acquiring legal status in Israel. The still photographs are also about time; they ask questions such as how long is time, what unfolds while waiting and watching the repetition of bureaucratic processes over which these people have absolutely no power. In the photographs we also see the engagement and interaction of the people with the photographer. 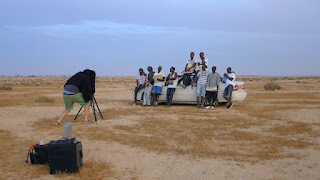 In the video Don’t Move, we watch one of the asylum seekers turn off the camera, then taking photos of him as he continues to fiddle with the video camera. 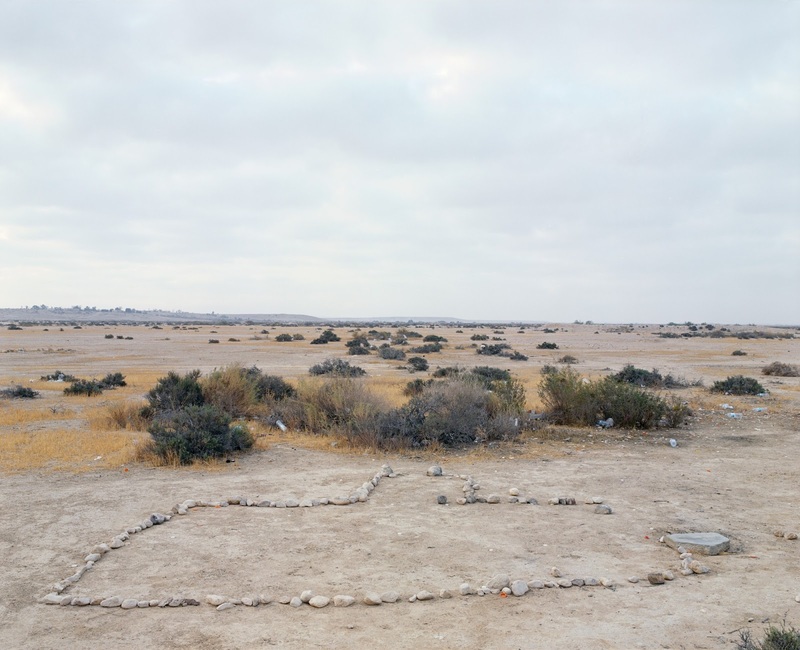 There is also a pervasive sense of the desert space in the photographs, across which Amir shows how the migrants have articulated their presence, identity, belonging, community, security, and the human instinct for order and repetition. Rocks are carefully laid out on a sparse desert floor to stake ownership. 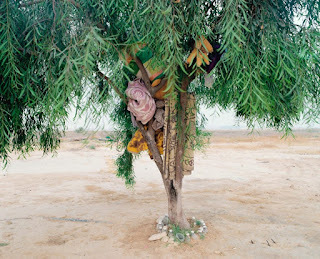 Blankets are rolled up and placed carefully in the arms of a tree’s branches in a photograph entitled L’Arbre de Bisharah et Anwar (2015), thereby naming the objects and space, encircled by a ring of empty water bottles and stones, as belonging to Bisharah and Anwar. An image of a few poles, wire sheets and turned over buckets strewn through a clearing in the shrubbery is titled La Cuisine de Tiko (2015) and though we may wonder how Tiko cooks anything of substance in his kitchen, we are soon reassured by the carefully placed objects as an expression of his care for the space. That it belongs to Tiko is more important than what he makes in his kitchen. 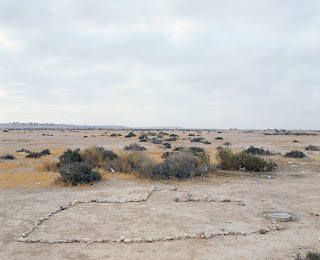 Another photograph Mosquée (2016) confirms that the stones on the sparse desert floor do not comprise a representation to be looked at, but a representation to be inhabited. We assume this simple space—that might otherwise be mistaken for some ancient message—will serve as a place of group worship in among the bushes and empty water bottles often strewn across this landscape. Like Tiko’s kitchen, the mosque and other spaces marked out in the photographs are filled with dignity, the spirit of community and care that the people have for each other. I found the exhibition moving, not only because of Amir’s skill in invoking the very human desire to belong, to identify, and create community. But also because here in Paris, the plight of the very same people may look different—they set up camp in densely populated metropolitan streets—but the problems are effectively the same. Always moved on by the authorities, looking to stake out a territory of their own as they wait for papers, visas and court dates, the Eritreans and Sudanese I see in their hastily built camps in the north of Paris face identical frustrations, and are ultimately searching for the same things as the rest of us.